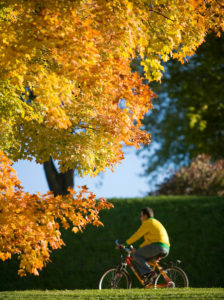 A cyclist pedals along a sidewalk path near Helen C. White Hall. Commuter Solutions, a unit of Transportation Services in Facilities Planning & Management, is your sustainable transportation resource. Commuter Solutions offers assistance with getting to, from, and around campus, including custom route planning that takes the worry out of getting to campus without a car. UW–Madison offers greatly subsidized bus pass programs for eligible students and employees. 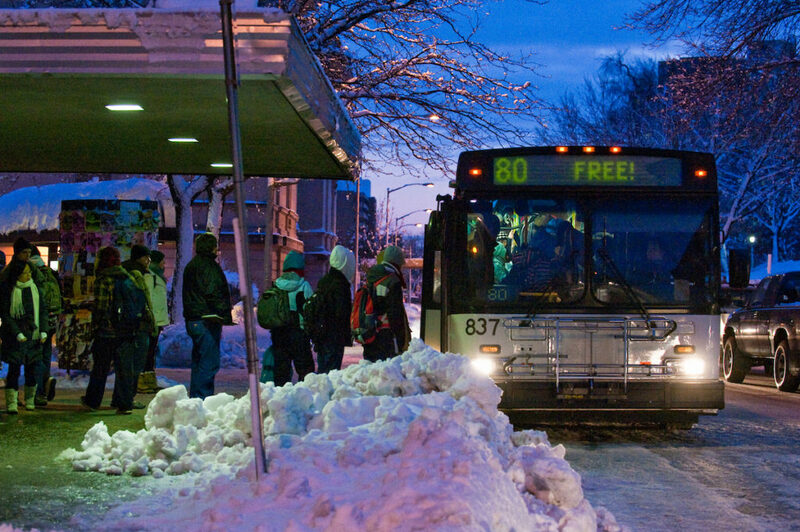 Taking Madison Metro Transit to UW–Madison is easier and more convenient than you might think. With the variety of routes, catching a bus is less stressful—and better for the environment—than driving alone to campus. There are also fare-free campus bus routes, including routes 80, 81, 82 and 84. Madison is one of the five best cities for bicycling in the nation! Commuting by bike is a simple way to cut down on campus congestion, save money, and help preserve the environment. With more bicycle parking on campus than automobile parking, thousands of students, staff and faculty commute by bicycle to UW–Madison! Need a car occasionally? Carsharing is a great alternative to owning or bringing a car to campus. Zipcar, UW–Madison’s carsharing partner, provides cars that “live” on campus and around Madison. Vehicles are available by the hour or day, with gas and insurance included. Discounts on personal memberships for UW students, staff, faculty, and UW Health employees are available. For vehicle locations, membership information, and to sign up, visit the Zipcar website. Pedestrians board and depart a Madison Metro bus at a stop outside the Memorial Union on Park Street. The bus is part of a route that provides free transportation to many parts of campus. Photo: Bryce Richter/UW Communications. The Emergency Ride Home program is a “safety net” for those who do not drive alone to campus, providing a free ride home in case of an emergency. Program specifics are available on the Transportation Services Emergency Ride Home page. Commuter Solutions has many other transportation options including carpooling, vanpooling, park and ride, and pay-per-use parking.